Fledgling Magpie - keeping an eye out for parent, waiting to be fed and then being fed. National Bird Week 2014 will take place between Monday 20 October and Sunday 26 October, 2014. The celebration of National Bird Week has its origins back in the early 1900s when the 28th of October was first designated by the predecessor of Bird Life Australia, the Royal Australasian Ornithologists Union, as the first ‘Bird Day’. Bird Life Australia organises and promotes Bird Week with the goal of inspiring Australians to take action and get involved in bird conservation efforts. 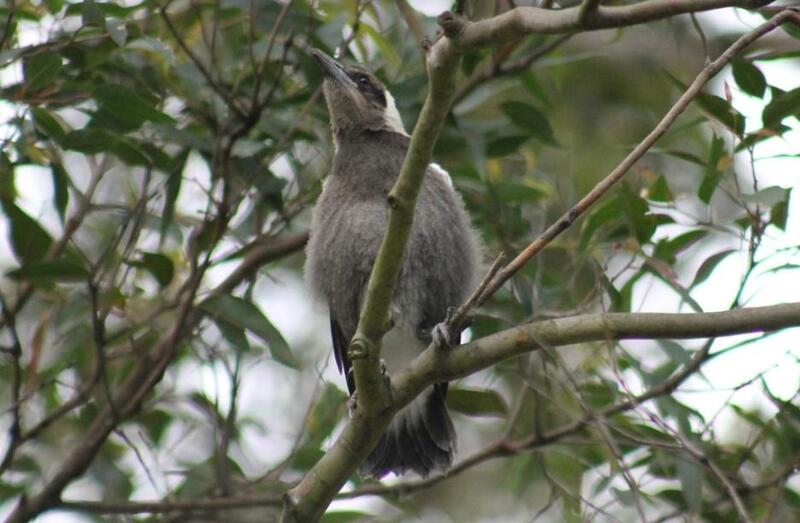 Currently the Aussie Backyard Bird Count is underway and if you have 20 minutes to spend watching those birds that come to your yard and trees then you can contribute! Not only will you get to see all that goes on in the bird world, and what bird society is like, this is an activity families can do together as citizen scientists! BirdLife Australia and the Birds in Backyards team have come together to launch this year’s national Bird Week event the Aussie Backyard Bird Count! 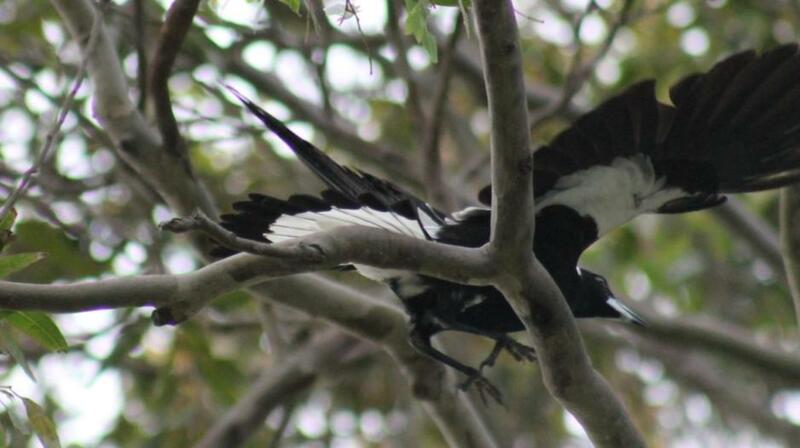 Celebrate National Bird Week 2014 by taking part in the biggest citizen science project to hit Aussie shores! From 20-26 October, thousands of people from across the country are heading out into their backyards, local parks or favourite open spaces to take part in the first ever Aussie Backyard Bird Count! To get involved all you need is 20 minutes, your ‘green patch’ of choice, and some keen eyesight (or binoculars!) And it doesn’t matter if you’re a novice or an expert—BirdLife Australia will be there to help you out along the way! Simply record the birds you know and look up those you don’t on their new Aussie Bird Count app (available for download now) or their website. You’ll instantly see live statistics and information on how many people are taking part near you and the number of birds and species counted not just across your neighbourhood but the whole of Australia! Not only will you get to know your feathered neighbours, but you’ll be contributing to a vital pool of information from across the nation that will help us see how Australian birds are faring. So get your friends and family together, head into the great outdoors and start counting! And this week will the last week to get involved! 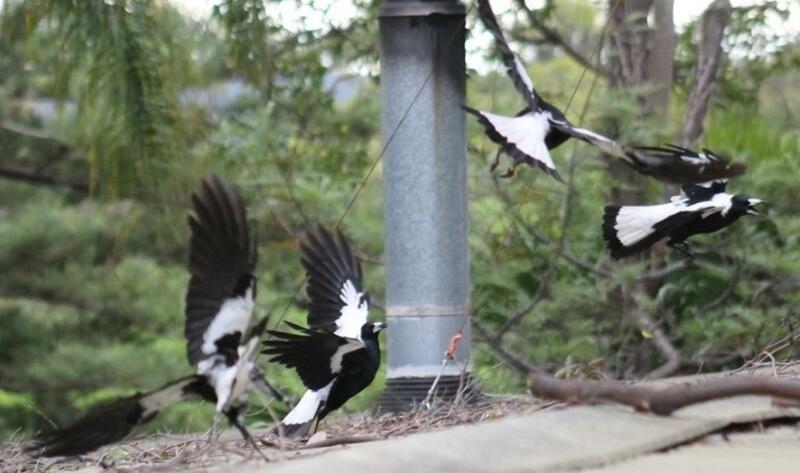 The Photos we share here to inspire you were are all this week in our front yard/ back yard and show you a brand new magpie calling for food and two pairs of magpie couples, who were having a bit of an argument over who would be inhabiting the trees in our our and the adjoining yards! Beautiful birds they are - and what you get to see and hear everyday when we keep our trees for those whose homes they are! Start your count. You can count anywhere! BirdLife would prefer each count to be done for 20 minutes. If you are unable to spare 20 minutes, do what you can, they'd still love you to be involved! Submit your checklist. Instantly see live statistics on how many people are taking part, and the number of birds and species seen near you and right across Australia. We hope you take part, hope you have fun and enjoy a foray into the world of birds and being a citizen scientist! Keep an eye on those trees and the grounds under them! These two above locked claws and spiralled towards the roof next door - only breaking off as they landed. 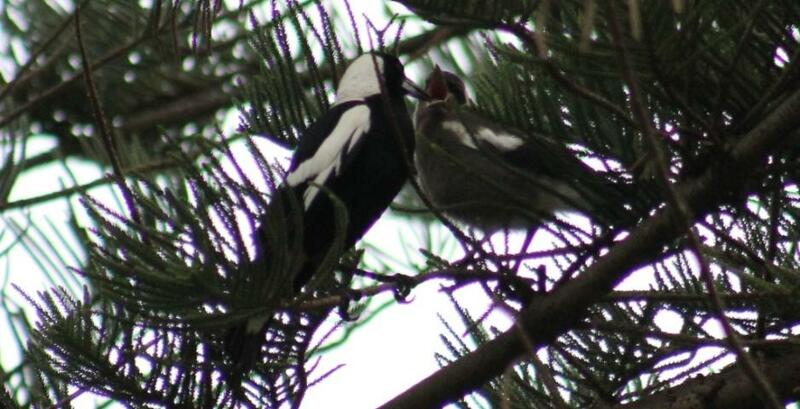 And flew into nearby trees - watching each other, before 'carolling' - a song that can mean 'here is ours'. Landing after flying shows the wonderful tail feather spans. Pictures by A J Guesdon, 15.10.2014.